For some reason, people keep insisting on giving us accolades for being cranky, irritable and disruptive influences on the services industry. However, the awards we received today (see link here) are an unbelievable validation of our team's hard work from the International Institute of Analyst Relations (IIAR) - and proof that we're not just a "flash in the pan" in the industry analyst business. IIAR's awards are widely recognized as the foremost accolades in the analyst profession, with such a large number of analyst-facing professionals providing the votes. Today, HfS Research won the individual award for "Analyst of the Year" for a second year in succession (some individual called Phil Fersht now sporting an ego so insufferable, it's rumored he can't even stand his own company). In addition to the individual analyst award, HfS Research topped the charts for "Outsourcing, BPO and Maintenance Analyst Firm of the Year". And this time, HfS Research was a runner-up for the overall "Analyst Firm of the Year", behind the formidable Gartner. Over 260 analyst and influencer relations specialists took part in this year’s survey - by far the greatest number to date, who voted on all the major research analyst organizations, such as IDC, Forrester, Ovum and so forth. According to some of the participants' entries, success factors included, “intelligent people with common sense”, “Research that is always compelling to read – and our clients like it” said another. One participant went further saying of HfS, “They are the heartbeat in the world of outsourcing and shared services”. My word - has the world gone mad? We're just a poky 14-analyst set-up where we still re-use our teabags in the morning and have to share two Men's Wearhouse suits for client meetings (we got the second one free...). 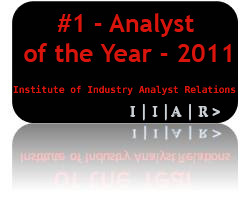 When we won the prestigious IIAR "Analyst of the Year" award last year, it was great to get some recognition for our hard work, but many people sniggered behind our backs that we would fade away pretty quickly. However, to retain that award this year, and also win the runner-up for "Analyst firm of the Year" is a validation that HfS Research is about to enter its third year in operation, with a strong mandate from industry that people are getting some value from our research, love our accessible model and the fact we can provide real data on industry dynamics practically as the happen. Anyhow, we would like to offer anyone who voted for us a cocktail on us when you see us at some upcoming conference, which we will be able to pay for out of the 20% price hike we're gonna add to our services. Thanks again - we really appreciate all the wonderful support, accolades and banter as we rumble into a third year of operations. Congratulations Phil & team. It goes to show that size and bravado does not matter. What really counts is quality, scientifically/statistically based research and not cookie cutter observations from years past. This provides NO VALUE to anyone and any person using it had better hope that their boss doesn't find out... you are making some critical mistakes based on crapsearch. Now you're going to be just impossible to deal with. Then again, that's no real change. This is a true victory for the disruptive little guy against the large dinosaur competitors. You guys are saving the analyst industry - you are a genuine credit to your profession. This is a heartwarming achievement, HFS team. Having been following your research for the last couple of years, I am very proud of you and your colleagues' accomplishment. Just don't forget us mere mortals who helped get you here! Having observed HfS evolve from a blog to a fantastic research firm, this is a spectacular achievement! Superb achievement! Well done HfS team! Amazing to see the little guys take down the monoliths. Shows how a bit of intellectual "horse power" can win the day. Quite astonishing, but not really surprising - people actually read HFS. This must be very satisfying for the HfS team. While your competition refuses to watch and learn how a small firm like HfS can build such a following and reputation, you continue to win all the plaudits! Long may it continue. Bravo! Wow, I just saw this. Great accomplishment and well deserved HFS! Congratulations, Phil and team. It's indicative, I think, of both the quality of your proposition and your standing in the industry that these awards come as absolutely no surprise despite the relative youthfulness of the HfS Research project - and I'm sure many more successes lie ahead.